A fun and playful holiday bark—perfect for cookie exchanges. 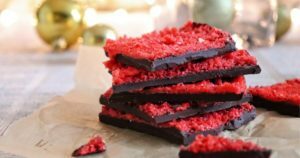 Semi-sweet melted chocolate is topped with strawberry pop rocks candy before cooling. Kids and adult-sized kids will love it! Pour melted chocolate onto a parchment lined baking sheet and spread evenly. Let cool slightly (still sticky but not melted) and sprinkle with pop rocks covering the entire top. Cool completely and break into pieces before serving. Tip: Any of your favorite flavors of pop rocks will work with this recipe. You can even experiment with combining flavors! But be sure not to refrigerate or wrap as this will cause the pop rocks to ‘melt’ and lose their pop. Instead, store in a cool (not so humid) spot in your kitchen or pantry. Take a picture after you make it and use hashtag #SGPartners to get registered to win gift cards! Basement Flooding and What to Do.